Trunks: Diameter 12 to 30 inches; bark gray, close, shallow-furrowed, smooth on young trees, small, tight plates and ridges on mature trees; branches ascending, crown widest near top. Twigs: Greenish, becoming brown, slender, rigid, mostly glabrous, lenticels prominent; leaf scars large, shield-shaped; bundle scars numerous, in 3 groups; terminal bud sulfur-yellow, scurfy, narrowly oblong, .3 to .6 inch, somewhat flattened; lateral buds egg-shaped, much smaller, 1/8 to 1/5 inch, pubescent or scurfy. Leaves: Alternate, odd-pinnately compound, deciduous, 6 to 12 inches long; petiole slender, 2 to 2.8 inches long; leaflets usually 7-9; petiolules 1/12 to 1/3 inch; terminal 3 largest, obovate, 4 to 6 inches long, 2 to 2.4 inches wide, terminal leaflet widest at middle or near outer end; lateral leaflets elliptic to lanceolate, 1.6 to 4 inches long, .8 to 2 inches wide; base of terminal leaflet tapering to point, bases of laterals unequally rounded or wedge-shaped; margins toothed; tips tapering to point; upper surface bright green, glabrous; lower surface paler, midrib downy pubescent. Flowers: May, after leaves partially grown, monoecious. Staminate catkins in clusters of 3 on peduncle .4 to 1.2 inch long; bracts at base of peduncle, lanceolate, pubescent; catkins 3.2 to 4.8 inches long, drooping, pubescent, many-flowered; flowers green, small, each with 3 pubescent bracts; stamens 4, anthers yellow, hairy. Pistillate flowers 2-3 in cluster, terminal on new growth, involucre 1/4 to 2/5 inch long, yellow, barrel-shaped, scurfy, lobes 4, green, acute, pubescent; corolla absent; stigmas 2, green, stout. Fruit: September and October; solitary or paired, nearly spherical to obovate, .6 to 1.2 inch long, .8 to 1 inch wide; husk brown, rough, scurfy, with 4 vertical ridges or wings extending from tip to near middle; nut light brown, egg-shaped, smooth; kernel fleshy, bitter. Habitat: Wooded uplands, bottomland woods, stream banks, floodplains; rich, loamy or gravelly soil. Uses: Excellent fuel source. Used to smoke meats. Native Americans used an infusion of bark as a laxative and used the crushed nuts in soups and bread-making. 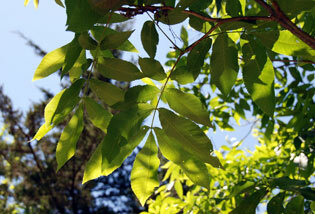 Comments: Bitternut hickory grows rapidly. It is one of the most common hickories in Kansas. The leaves turn yellow in autumn. The wood is heavy, very hard, strong, brown, sapwood white, wide. The woods was used in tool handles, barrel tops, and ox yokes. Carya is ancient Greek for "walnut".